As a sales professional operating in the digital age you’ve got a lot coming at you, fast. You’ve got inbound leads from digital channels, opportunities that are aging fast, and active accounts prime for upselling with additional products and services. Luckily you’ve got tools and those tools are getting a whole lot smarter thanks to artificial intelligence. Artificial intelligence is machine learning that is able to digest huge amounts of data in a very short amount of time to evaluate key criteria, understand patterns in the data, and make smart predictions about what is likely to happen in the future based on that data. This synthesizing of information into actionable insights is called predictive analytics and when you know how to harness its power, it can help you by saving time and maximizing the return on your efforts. Opportunity scoring – machine learning is applied here to understand how likely an opportunity is to being converted to “closed-won”. This is based on the opportunity’s attributes (company, market segment, products of interest, deal size, industry, etc) and regressed against all other historical opportunities that have either converted or not. The key players in this segment include Microsoft Dynamics and Salesforce Einstein. Microsoft Dynamics – Dynamics 365 AI for Sales uses a scoring model to assign an opportunity score based on signals from opportunities and related data. Salesforce Einstein – Opportunity Scoring identifies poorly-performing opportunities for sales rep to address. Einstein Opportunity Insights allows reps to address at-risk deals and gather best practices from successes (which moves from predictive analytics to prescriptive analytics). Node.io – allows users to create ‘clones’ of ideal customers, and run a query against Node’s expansive platform of accounts and leads. It then creates a prioritization list of leads and contacts to target. Infer- delivers company-specific AI algorithms to better target and prioritize leads based on historical conversion. Improves efficiency in purchasing lead lists, by identifying high quality leads. 6sense – their Sentinel AI platform applies machine learning to intent-to-buy pattern changes across various leads and increases transparency between sales and marketing. 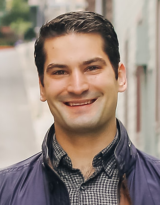 Mattermark – provides a Mattermark proprietary score to clients’ list of leads, helping companies prioritize which leads to pursue. Salesforce Einstein – analyzes historical sales data to determine the top factors of conversion from a lead to an opportunity. Sales reps can prioritize leads, as they gain insight into factors that convert. IBM Watson – determines high value leads, and recommends which products to position and best ways to engage with these leads. 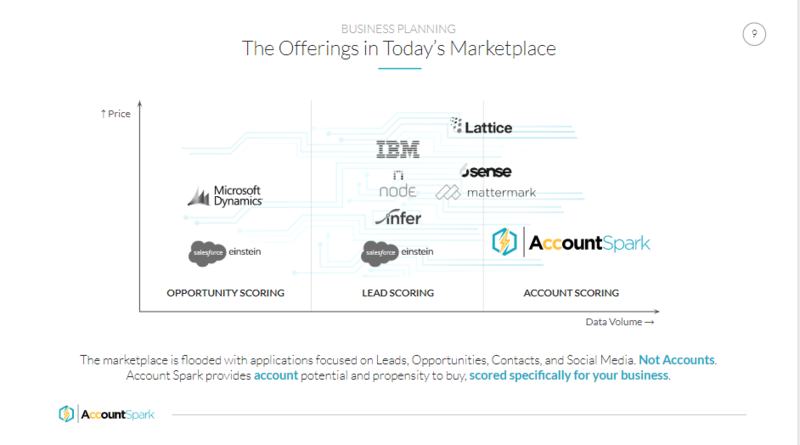 Account scoring – this is the solution line that has been historically untouched by scalable, sales AI technology, until today with Account Spark. Account Spark’s technology is focused on account attributes (SIC industry, company size measured by annual revenue or number of employees, region, public or private, etc.) to determine both an account’s booking potential and the likelihood of winning new business with them based on your company’s product offering and past performance. Account Spark is the only solution that quantifies an account’s fit with your product suite, ensuring that insights are actionable and relevant to you. Here’s a graphical summary of the key AI players in the three solution lines described for sales. AI is changing sales. There’s no doubt about it. 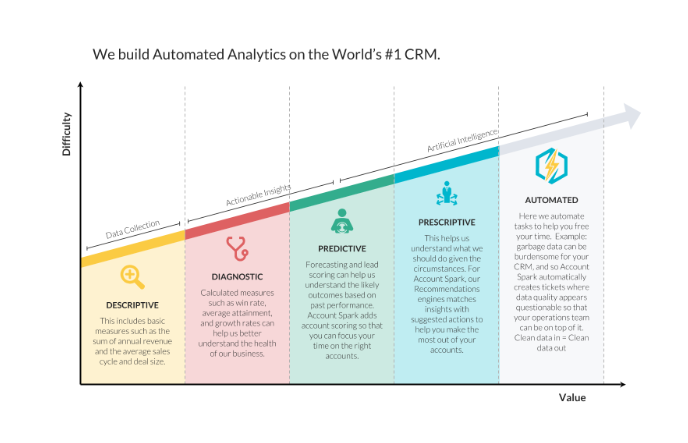 Predictive analytics offers a powerful new set of tools, that can give you valuable insight into opportunity and lead scoring, but it’s just the beginning. Using the tools available today through Account Spark, you have the ability to step into the world of account scoring and give your team an advantage over the competition. Account Spark’s proprietary grid can offer you a clear picture of which differentiated strategies have worked well for others in the past and use it to make smart decisions about the accounts you have in front of you today. This generation of recommended strategies from past successes can be grouped into a category of AI called prescriptive analytics. Imagine using prescriptive analytics to generate and share lists with partners; send email campaigns to prime prospects; and get the most accurate insights into accounts by logging data quality tickets against accounts that have incomplete or invalid data. Sounds exciting, right? At Account Spark we are dreaming even bigger and moving boldly to a future that harnesses the power of both prescriptive and automated analytics. Said differently, we envision a world where AI will not only provide recommendations, but automatically execute against such recommendations, allowing sales reps to focus nearly 100% of their time on the client, and doing what they do best – selling. The future of the space is bright and we are standing on the cusp of the AI revolution, won’t you join us?